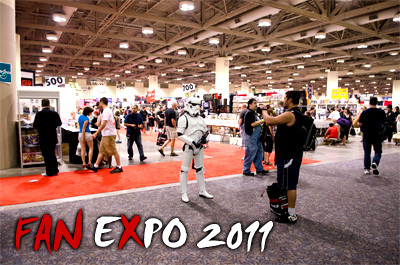 My 7th year at Fan Expo, and luckily a good one at that. After last year's super-dense con, the convention felt a lot roomier and relaxing this year, I'm glad most of the bad experiences stayed with last year's. I started my con off on Friday, having no interest in the Thursday. The lines moved by very well, impressed with how organized the lines were, that's not to say I enjoyed feeling almost like a sheep trapped within a fence being herded in one direction. I felt as though the tracks were too long and there weren't enough "exits" to an open area, and no short cuts to go to the lesser-populated areas. I wasn't a fan of having to take the long way every time to an open area, though the lines weren't difficult to figure out. The weekend started off with me meeting friends and chatting up, conventions are a great opportunity for that. I quickly scoped out the dealer's room to see what's where. One of my first attractions was the new Halo game, nothing much to say about it. It was a decent day with a total of one photoshoot. I was expecting Saturday to be a lot more busy, maybe it was how well-organized it was or the fact that there was more room then previous south-building years, but it was much less stressful then last year. Had some photoshoots as that was my aim. It did feel as though there weren't that many cosplayers this year, a lack of anime too it felt. Nice to see a variety though. Sunday was another good day, topped everything off with more photoshoots, meeting with friends and a good dinner at the end of the day. Almost slipped my pizza lunch after bumping into someone else, I managed to catch it with minimal pieces flying off, Shaun from G4TV came to see if I was ok, he's a great guy. There was also plenty of advertising from Rogers about the Android phones on their network, even saw an android cosplayer at that. One gripe I had was the lack of photoshoot locations available. Its a busy con and finding an empty area was a tad difficult but not impossible. There was construction on two sides of the con, hidden areas only accesible by long-cuts from line, and poor poor lighting inside the convention. My last complaint is the wrist-bands, Hobbystar, can you please get rid of them for next year? They were atrocious last year, and once again this year. They are nowhere as cool-looking as a badge, and the extra money we paid for entrance should be able to cover the slightly more expensive typical badges we should get. Having a wristband for 3/4 days is simply uncomfortable, sleeping with it, etc... I know some people made theirs loose to escape some torture, but I was not as lucky. They are also difficult to work with when taking photos, they stick out like a sore thumb, photoshoots are not as pleasent for either party. I also can't help but feel like a tagged sheep in a herd rather then a visitor at a convention with the disgusting wristband. So please, bring back the traditional badges for next year, the ones the media/artist/guests had. I'll be hoping further improvements will be made for next year, and maybe we'll even get to see an aquarium next door half-finished. So decent con, but looking for a lower-price next year and other remarks I made for next year, till then. Check out the con photos here, and photoshoot gallery here.